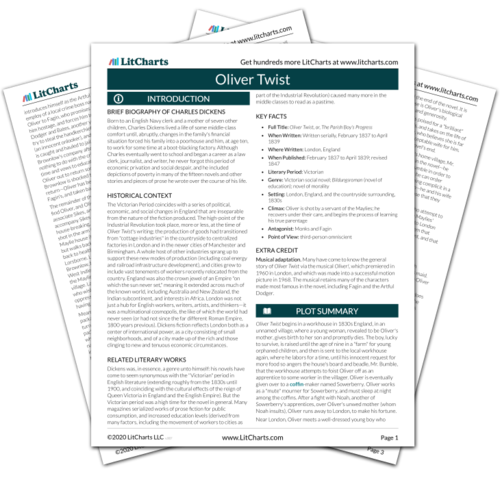 Instant downloads of all 945 LitChart PDFs (including Oliver Twist). 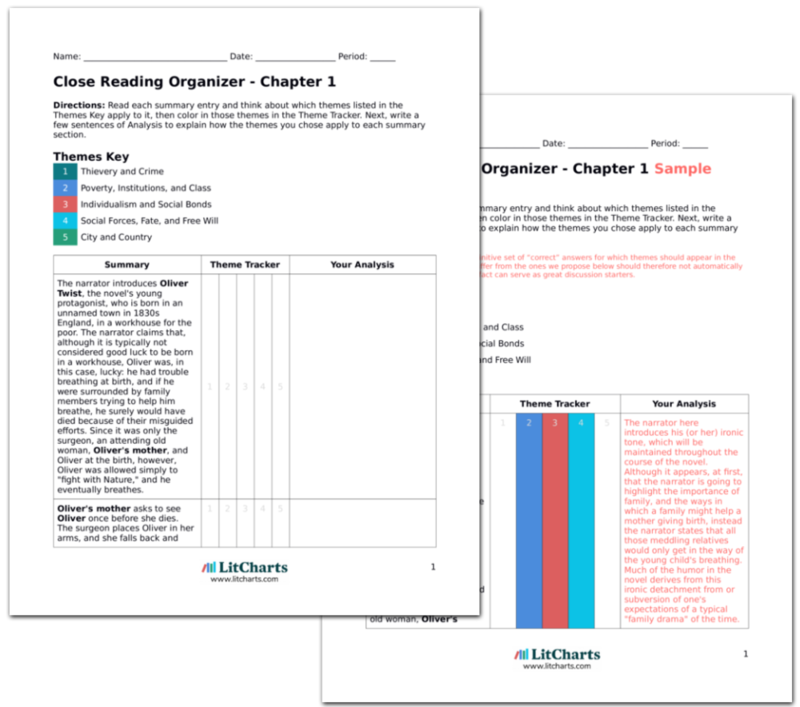 LitCharts assigns a color and icon to each theme in Oliver Twist, which you can use to track the themes throughout the work. Oliver continues working for Sowerberry as a "mute," and because it's a time of year when sickness is more prevalent, the coffin trade increases, and Oliver attends more funerals. Oliver notes that many mourners—including people who have lost their wives and husbands—seem all too happy to bury their dead, and to look for new partners. Oliver interprets this as a sign of their happiness, but the narrator implies that these people are actually selfish and heartless. Another of Dickens' ironies. Dickens makes it seem as though he does not judge those "mourners" who use funerals as excuses to meet new romantic partners—when, of course, Dickens is strongly criticizing the apparent superficiality he sees in the Victorian middle class. Noah keeps ordering Oliver around, and Charlotte, following Noah's lead, does so as well. Mr. Sowerberry tends to look out for Oliver (because Oliver is so useful for business, serving as a mute), and Mrs. Sowerberry, to oppose her husband, typically criticizes Oliver. Marriages in the novel tend either to be Happy or Unhappy, with very few falling in between. The Sowerberrys' marriage, like the Bumbles' later on, falls into the latter category. An important episode is recounted: Noah and Oliver descend to the basement to eat dinner (as usual), and Noah asks about Oliver's mother. Oliver replies that she is dead, and Noah, knowing this, goes on to say that Oliver's mother was a "bad ‘un"; he implies that she was a prostitute and a criminal. At this, Oliver becomes enraged, and flies at Noah in a fury. The implication here is that Oliver's mother, apart from having Oliver out of wedlock, was also what Victorians would call a "woman of loose morals." This is not borne out by the facts of Agnes' life—as Edward, Oliver's father, was her true love, and she was committed to him. Noah immediately cries out (coward-like) for help, and Charlotte and Mrs. Sowerberry rush to his aid, pulling Oliver away, and remarking that they always knew Oliver was a bad seed. They pledge to inform Mr. Sowerberry of Oliver's actions when he returns home. Noah feels he is lucky to be alive. No mention is made of the fact that Noah incited the fight. Charlotte and Mrs. Sowerberry send Noah to tell Bumble of the fight. Noah appears to talk a good deal, but when it comes to fighting, Oliver—never one to instigate—will battle to defend his principles, and, in this case, to protect his mother's reputation (although at this point he knows nothing about his mother). Oliver's bravery here is implicitly praised by Dickens, and Noah's cowardice is criticized. 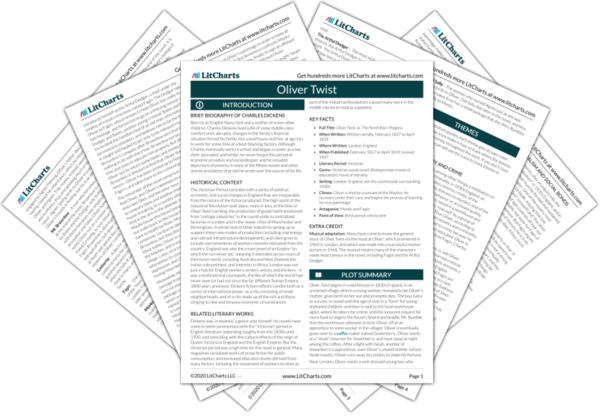 Get the entire Oliver Twist LitChart as a printable PDF. Schlegel, Chris. "Oliver Twist Chapter 6." LitCharts. LitCharts LLC, 5 Jan 2014. Web. 23 Apr 2019. Schlegel, Chris. "Oliver Twist Chapter 6." LitCharts LLC, January 5, 2014. Retrieved April 23, 2019. https://www.litcharts.com/lit/oliver-twist/chapter-6.